Disco legends band together for a New Zealand show. The Jacksons, Kool & the Gang, The Pointer Sisters, Village People, Sister Sledge and The Sounds of the Supremes to play an exclusive NZ show this summer! Neptune Entertainment is pleased to announce A Summer’s Day Disco, which will bring together some of disco’s biggest icons for the first-time ever, for one magical show. 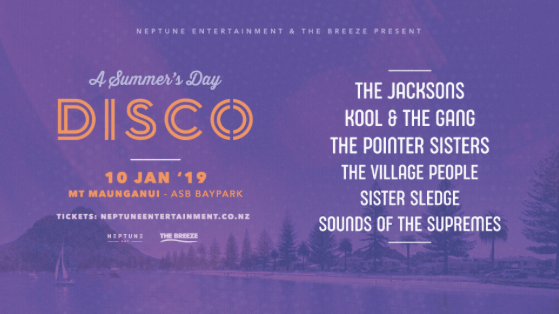 The Jacksons, Kool & the Gang, Village People and Sister Sledge are all on the bill and will perform back-to-back at ASB Baypark, Mount Maunganui on Thursday January 10, 2019. It sets the scene for what is sure to be one of the most talked about concert line-ups of the summer. Tickets go on sale at 7.00pm on Wednesday October 3 from The Ticket Fairy. Rock n’ Roll Hall of Fame inductees The Jacksons, featuring original members Jermaine, Jackie, Tito and Marlon will lead the charge, playing the hits that started a dynasty including ‘Can You Feel It’, ‘Blame It On The Boogie’, ‘I’ll Be There’, ‘ABC’ and many more. Kool & the Gang will keep the playlist pumping with hits from throughout their five-decade career including ‘Celebration’, ‘Get Down On It’ and ‘Jungle Boogie’ while three-time Grammy winners The Pointer Sisters will bring their swag of party-starters including ‘I’m So Excited’, ‘Jump (For My Love)’, ‘Neutron Dance’, ‘Slow Hand’ and ‘Fire’ to delight generations of fans. Village People, led by founding member Victor Willis, will show why they are the kings of the era with their smash hits including ‘Macho Man’, ‘YMCA’, ‘In The Navy’, ‘Go West’ and ‘Can’t Stop the Music’. Sister Sledge will bring the party with ‘We Are Family’ and ‘Lost In Music’ and ‘He’s The Greatest Dancer’, and Sounds of the Supremes will open the party, bringing the inspiration of disco to the stage with their greatest hits of the 60s and 70s. Don’t miss this once-in-a-lifetime opportunity to see the Kings and Queens of disco together for one magic night under the stars.